RFID and AIDC News: Ready for Some RFID Tags with your Oatmeal? RFID and AIDC News: Ready for Some RFID Tags with your Oatmeal? RFID and AIDC News: Ready for Some RFID Tags with your Oatmeal? 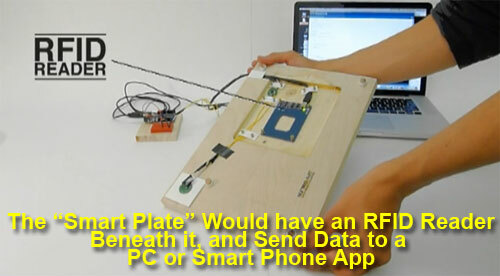 A student at London's Royal Academy of Art caused something of a stir this month with a design prototype for an RFID-based system to monitor diet and food safety, featuring in part a new "RFID smart plate," but it is the system's reliance on "digestible RFID tags" that has caused the technology and privacy blogosphere to go wild with the news. Harms himself told SCDigest that the University of Manchester in the UK is also doing advanced research on the subject, and has developed "The first edible and fully digestible RFID tag." The edible/digestible RFID tags (more on this below) would be placed directly into food items. At what proportions and levels is not yet quite clear. The edible tags could hold information about where the food was grown or shipped from, what the ingredients are, how far it has traveled, its expiration date, what the nutritional content is, and more. Harms calls the idea " embedding data in food." Readers could be placed in the refrigerator, pantry or who knows where, but the design prototype focuses on a system using a "smart plate" that utilizes a blue tooth wireless connection to your PC or smart phone that sends information about the food you are preparing to eat, such as the number of calories or the grams of fat, whether it contains ingredients you might be allergic too, and other useful information. A short video of the concept can be found here: NutriSmart Concept Video. The concept of edible/digestible RFID tags has been around for some time, and in 2007 Kodak filed a patent for such tags, though the application there was for use in medical applications. The idea was that small digestible tags would be attached to pills or other medicines. The patent describes how such RFID tags would be useful for verifying proper drug usage, monitoring drug interactions, controlling dosage and even maintaining inventory control. Some digestible RFID tags are already in market use in medical applications. Searching for digestible RFID patent filings produces a number of submissions. One approach is to use organic materials. Others suggest that the tags could be made small enough such that if you eat one, your stomach acid will naturally break it down into a tiny amount of silver that's less than what you'd find in tap water. Our question is how would you know if you are eating a lot more than one? After they are activated, IEM’s create an “ultra-low-power, private, digital signal” that can be detected by a microelectronic recorder. The system is able to timestamp the ingestion of a specific pharmaceutical or other discrete events, and to record these events along with physiological data such as heart rate, activity, body angle and other patient-logged information. The Proteus technology has been approved by the European Union. For the prototype, however, Harms simply used a traditional RFID tag. Even if people decided swallowing RFID tags was acceptable, in the end cost might be the application killer. Embedded RFID tags in cheese or soup would certainly add to the cost of the product, and we're not sure consumers would pay very much to track their eating habits and food safety. But the prototype does raise some interesting questions about how far the "internet of things" can go - RFID visionaries certainly envisioned a tag on each jar of peanut butter years ago, but not many with the tags actually in the peanut butter - and a whole new round of privacy and "big brother" concerns as the size and form factor of RFID and sensors move in ways that seem more science fiction than reality - but it's not. What's your reaction to this concept? Will people ever eat RFID tags in food? Do you see any dark sides to where all this is going? Let us know your thoughts at the Feedback button below.